Robert joined Eastbourne Vets in June 2017 as Clinical Director. Having worked in Senior Management roles within the veterinary industry over the past 9 years, Robert moved to Eastbourne Vets to continue his career journey. 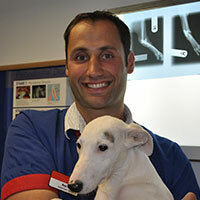 Robert holds a professional qualification in Veterinary Medicine along with 13 year of Veterinary experience. Robert loves animals and has a particular interest in Dermatology cases. Robert is married with children and spends most of his spare time with his family.